Photography is an enjoyable way to capture the many adorable moments of our pets' lives. You don't have to hire a professional photographer to have high-quality pictures of your dog. Even if you have little or no background in photography, you can take compelling pictures of pets by following a few basic dog photography tips and techniques. Generally, the best light to use when photographing your pet is natural light. 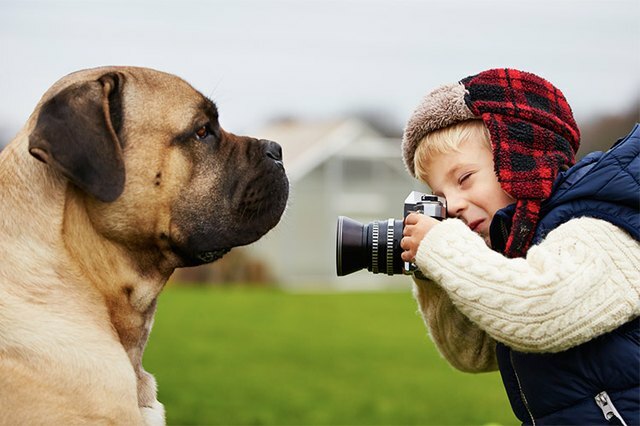 If possible, take the dog outside for the photography session. If the dog will not cooperate outdoors, take the photos in a well-lit room near a large window. Without overtiring the dog, experiment with different angles, locations, and compositions. Take as many pictures as you can to increase your chances of capturing that one magical moment. The macro setting on a digital camera is useful for getting close to the subject and achieving a clear, defined image. In addition to full body shots, take advantage of your camera's macro setting and take close-up shots. The can result in stunning, expressive photos of your pet. When taking a picture of your dog, always photograph the pet on its level unless you are aiming for a photo of the dog looking up at you. Do not attempt to make the dog come to you or stay in a certain pose. Instead, go to the pet and take the picture from its level. Cameras can be distracting for dogs and cause them to behave uncharacteristically. Until he gets accustomed to seeing you with the camera, there's a chance he might react strangely to it at first. Consider having a second person present to distract the dog while you are taking pictures. Action shots are ideal for owners wanting to show off the athleticism and personality of their dog. When taking action shots, allow the dog to play in a natural manner. Think of action shots as high-quality candid photos; the naturalness of the shot generally makes for an interesting and individual photo. Taking photos of your dog requires patience. With all the commotion, many dogs become excited and frisky. However, if you're willing to patiently wait it out, the dog will typically calm down and let you take photos.